Get ready to say G’Day with this captivating Aussie Adventure. Embark on an experience highlighting Australia’s most famed regions and iconic land marks. Embrace native heritage and local wildlife as you trek through the Outback in search of your very own cultural awakening. Dive into nature’s largest underwater eco-system as you step off the white sand island beaches and into the Great Barrier Reef. Wrap up your Down Under sojourn with a visit to Australia’s premier city, Sydney, to explore the renowned Sydney Opera House and Sydney Harbour Bridge. Cross the International Date Line, an imaginary line on the surface of the Earth that runs from the North to the South Pole – and defines one calendar day from the next. Crossing the International Date Line adds one day (24 hours) traveling west, and subtracts one day (24 hours) traveling east. On arrival into Melbourne you will need to clear customs and make your way through the main arrivals hall from where you will either catch a taxi into the city or be transferred to your accommodation. At first glance, Melbourne may resemble any other modern city with its skyline full of concrete and glass. However, if you look a little closer, you’ll find the real Melbourne, a city of unique charm. There are the clanging trams (street cars), swanky boutiques, friendly taxi drivers, Australian Rules Football, fickle weather and ‘BYO’s’, by the hundred (restaurants to which you bring your own liquor or wine). Add to this, Melbourne’s traditional virtues of tree lined boulevards, glorious parks, elegant buildings and imposing Victorian Banks and Churches, and of course the giant Melbourne Cricket Ground and you’ll have some idea of the city. Melbourne has become a polyglot society with a huge diversity of cultures, Italian, Greek, East European, Middle Eastern and Asian. This diversity is reflected in the food styles, the lifestyle, and even the language spoken in the street. See kangaroos and koalas in the wild! In small groups this naturalist guided eco-tour gives you quality time to learn about wildlife and enjoy the wide open spaces of Australia. Watch the natural behavior of wild kangaroos, koalas and abundant birdlife. Get involved in koala research with your naturalist guide. Walk amongst free ranging “mobs” (groups) of wild kangaroos. Spot emus, cockatoos and other unique Australian wildlife on the grasslands, in the bush and around the billabongs of Melbourne’s Western Plains. Visit an open forest in a National Park that is home to a large and healthy population of wild koalas. An ongoing Koala Research Project ensures that on most days there are multiple sightings of these delightful creatures. Within easy reach from the center of the city of Melbourne, these environments provide the perfect introduction to Australia’s unique wildlife and indigenous culture. During your journey your guide will share with you the great significance of the Western Plains to Aboriginal People. A delicious bush lunch is included. At your leisure to explore the very cosmopolitan city of Melbourne. The many attractions of the city vary from the spectacular parklands and gardens that surround the city, to the museums and festivals that are a continuing part of the city life. Excellent restaurants are on every corner and cater to every taste in the world. Transfer to the airport for your flight to Adelaide. Upon arrival you will be transferred to your hotel. The gracious capital of South Australia, Adelaide is the City of Churches, orderly streets, manicured parks and superb restaurants, where cultures from all over the world have contributed to a vibrant, energetic community. Adelaide is today, an orderly, airy city ringed by beautiful parks and gardens and graced with elegant sandstone buildings and cottages. There are more restaurants per head of population than any other Australian city. From expensive bistros to the formal and exotic, most serve a range of outstanding local wines from the famous ‘valleys’ nearby. Home to over one million people, Adelaide is best explored on foot to properly experience the wealth of art galleries and museums, festivals, markets, cafe society and superb shopping. Depart from Adelaide airport for your short flight to Kangaroo Island. On arrival you will be transferred to your accommodation. The two days of touring tour shows you the sights and aromas of the Australian bush, close up wildlife encounters and stunning flora. Gourmet style picnic lunches are enjoyed in tranquil bush settings and overnight accommodation is included. See and visit natural bush land sanctuaries rich in wildlife, dramatic coastlines, sea lion and fairy penguin colonies. Visits to the well-known Seal Bay, Remarkable Rocks and Flinders Chase National Park are also highlights of the tour. Enjoy another day exploring Kangaroo Island before your tour ends at Kingscote airport on the afternoon of day two, for your return flight to Adelaide. Upon arrival you will transfer to your hotel. Regardless of the season, the Adelaide Hills offer a welcome respite in country air. Investigate historic townships and enjoy heritage accommodation properties with stunning gardens. Adelaide has a great reputation for its art and culture. The Adelaide Festival of Arts and associated Fringe Festival generate a constant energy in the city. The Festival Centre on King William Road is the hub of opera, theatre and orchestra. For visual arts, the Art Gallery of South Australia is a must for its collection of Aboriginal works, Australian 19th century paintings and a collection of Rodins. Several galleries specialize in indigenous art and Melbourne Street is the place for antiques. Transfer to the airport for your flight to Ayers Rock. Upon arrival, you will be transferred to your hotel. Uluru, in the heart of the Red Centre, has a desert climate – mostly dry, with brilliant blue skies all year. Autumn and spring will give you sunny days with cloudless skies and crisp, cool nights which is the perfect kind of weather for exploring the sights by foot or in the comfort of a vehicle. Summer is the time when Central Australia is at its most vivid, with hot days and balmy nights. December through February are the hottest months – usually more that 95º Fahrenheit – so take a hat and sunscreen. Departing your accommodation, today’s excursion will travel through the landscape to the entrance of Uluru Kata Tjuta National Park. From this point, it is only a matter of minutes before the spectre of Uluru rises from the sand dunes to demonstrate its enormity and presence – our first stop allows you a photographic opportunity of this amazing icon. With Uluru looming in front, walk with your guide to a place of tranquility at the base. The closer you wander, the more you surrender to the realization of the sheer size of this monolith. As you drive around the base, your guide takes you to the entrance of Mutitjulu Waterhole, a semi-permanent watercourse nestled in the contours of Uluru. Here, learn the Creation stories of Liru (poisonous snake) and Kuniya (python) and their battle for control of Uluru as well as a number of other stories associated with other prominent Tjukurpa (Dreaming) stories. See the rock art of the ancients and learn how Uluru was, and still is, a significant location for teaching young Aboriginal people. We then adjourn to the Talinguru Nyakunytjaku viewing area where you will observe an uninterrupted view of Uluru with Kata Tjuta in the background. Travel through the landscape to the entrance of Uluru Kata Tjuta National Park. From there is it a 25 mile journey through the desert landscape to the mighty rock formation. On arrival at the viewing area you will walk to the best vantage point to see the 36 domes that comprise this amazing icon. You will then make our way to the western side of Kata Tjuta where you journey between the domes for a walk up Walpa Gorge, named for the wind (Walpa) that whistles between the massive domes. As you stroll between these mighty conglomerate rock walls your guide explains how the environment and the geology have evolved over millions of years. This is an afternoon tour of approximately 3.5 hours. Transfer to the airport for your flight to Cairns. Upon arrival you will be transferred to your accommodation. Cairns is the gateway to Tropical Far North Queensland, a region of contrasts and surprises. It is home to the Great Barrier Reef, palm-fringed isolated beaches, Kuranda and the Atherton Tablelands, World Heritage listed rainforests and the sun burned outback. This dynamic area serves as a diverse hub for many attractions and activities of the Tropical North. Apart from the major tourism attractions of the Reef and Rainforest, there are many adventure sports such as white water rafting and bungy jumping, as well as other activities such as golf and trail riding. This morning, transfer to the wharf for your full day excursion to the Great Barrier Reef. You will have four hours at the reef site, to explore what makes the Great Barrier Reef one of the wonders of the world. The day trip has been designed with the water enthusiast or novice alike – snorkel gear and instruction is provided for all guests, or stay dry and explore the stunning reef from the comfort of a semi-submersible vessel, just one meter underwater. Introductory and certified dives are run in conjunction with snorkeling day trips at an additional cost, and guided snorkel trips with a marine biologist are also available for a nominal fee. A tempting hot and cold buffet lunch is included, as well as morning and afternoon tea on board. Transfer to Freshwater Railway station to meet your host who will run through the day’s schedule. Board the train, sit back and enjoy the scenic journey through tunnels and past waterfalls to Kuranda. On arrival, you are taken to Birdworld (optional extra cost), followed by some leisure time to explore the village and markets before meeting your host back at the Skyrail Terminal. Marvel at the spectacular views as you glide silently above the rainforest canopy. There are two stations en route where you can alight to walk through the rainforest to scenic lookouts. Skyrail ends at Caravonica Lakes where we have a buffet lunch at the Boomerang Restaurant. Next, enter the Tjapakai Aboriginal Cultural Centre – you will be personally escorted by an Indigenous guide during your time at Tjapukai. There are stage shows, movie theatres, craft demonstrations and an Aboriginal Village – just a few of the attractions that provide an insight into Aboriginal culture and history. The major center in Tropical North Queensland is Cairns, a popular gateway to the Great Barrier Reef. The city is fringed by lush rainforests and, to the north and south, are miles of white sandy beaches and turquoise oceans teeming with marine life. Transfer to the airport for your flight to Sydney. Upon arrival you will be met and transferred to your accommodation. 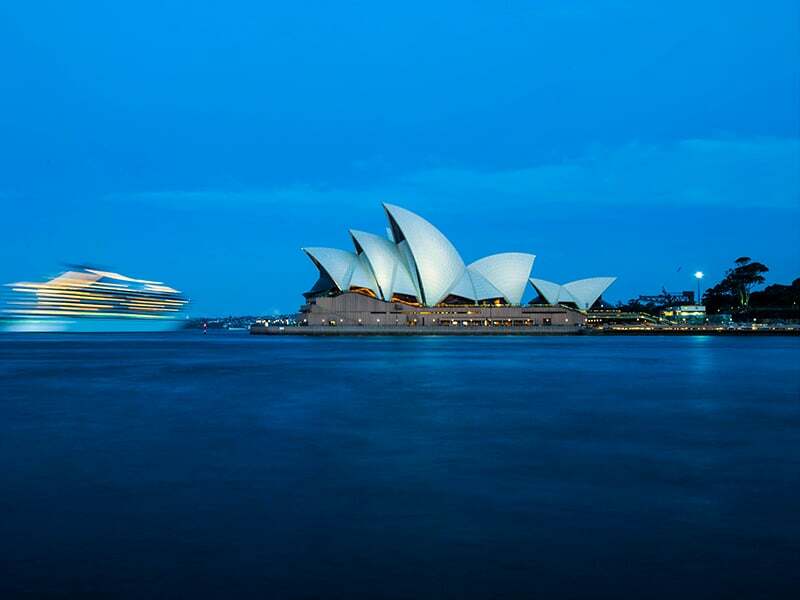 Sydney – Australia’s premier city is the oldest settlement in Australia, the economic powerhouse of the nation and the country’s capital in everything but name. Built on the shores of the stunning Port Jackson, you would have to die and go to heaven before you see a more spectacular setting for a city. It’s a vital, self-regarding metropolis, exuding both a devil-may-care urbanity and a slavish obsession with global fads. The Sydney area was the ancestral home of the Daruk tribe, whose territory extended from Botany Bay to Pittwater. There are some 2000 Aboriginal rock engraving sites in the Sydney area, and many of Sydney’s suburbs have Aboriginal names. The city of Sydney began life as a penal colony in 1788 and for the next 60 years received the unwanted, persecuted and criminal elements of British society. Despite its brutal beginnings, the city’s mixture of pragmatic egalitarianism and plain indifference has transformed it into a thriving multicultural society. Sydney now attracts the majority of Australia’s immigrants and the city’s predominantly Anglo-Irish heritage has been revitalized by large influxes of Italian, Lebanese, Turkish, Greek, Chinese and Vietnamese. Sydney truly is one of the most beautiful cities in the world with its spectacular harbor setting, fascinating convict history, bustling downtown area and an exciting blend of architecture, ranging from convict built early colonial style reflecting our heritage, through to the world famous Sydney Opera House. Enjoy a city sights tour, which will provide you with an introduction to the highlights of this fabulous city, giving you a taste of what you may wish to further explore during your stay. At your leisure to explore Sydney. Most of the major attractions of the city are within easy walking distance of your accommodation – Sydney Opera House, Darling Harbour, Centrepoint Tower, Circular Quay, The Rocks etc. You will be met and transferred to the airport for your departure flight.